This kit is used to perform the classic experiment of the 'Monkey and the Hunter'. This kit is used to perform the classic experiment of the 'Monkey and the Hunter'. It is a great demonstration of two-dimensional motion concepts and the independence of the horizontal and vertical motion of a projectile. 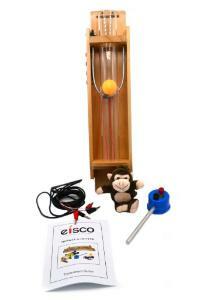 The kit contains a launcher, a projectile, connecting cables, a stuffed monkey and an electromagnet. You will need a low voltage power supply that operates at 4V d.c. The current requirement is about 0.4A. 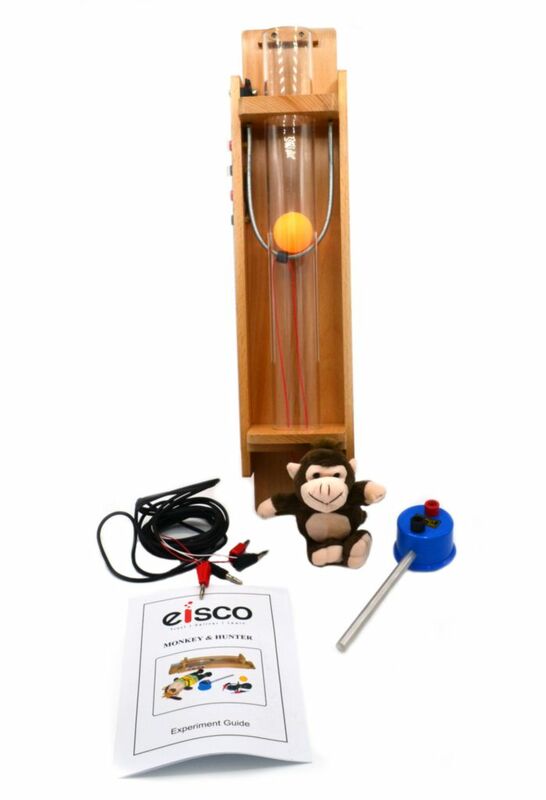 The monkey is suspended from the electromagnet by a metal cylinder on its head and when the launcher is triggered the electromagnet will release the monkey. The student can then apply their observations to study formulas related to the experiment. The kit contains a detailed instruction manual.